A Northwich woman has been ordered to pay a total of £830 after admitting fly-tipping. Katie Connor, 30, of Thornley Green, Northwich, was prosecuted by Cheshire West and Chester Council for fly-tipping 12 bin bags of domestic waste which had been left strewn on the ground beside Pole Lane in Antrobus. 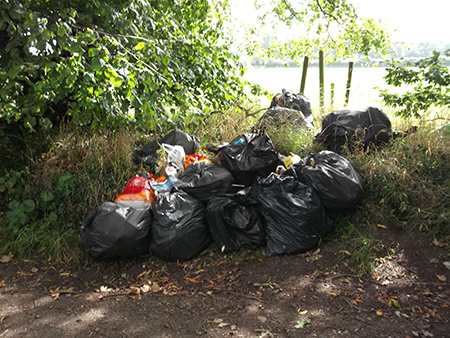 The incident of fly-tipping was reported to Cheshire West and Chester Council by a member of the public on 24 August 2017 and an investigation was launched. A Council enforcement officer attended the scene and, after an inspection of the waste, the rubbish was traced back to Ms Connor. Despite Regulatory Services contacting Ms Connor on four separate occasions to invite her to attend a formal interview under caution to account for the waste, she failed to attend. On 28 June 2018, Ms Connor attended court and entered a not guilty plea and the case was adjourned. She returned to court on 21 August 2018 when she changed her plea to guilty. She was subsequently fined £300, and ordered to pay £500 prosecution costs and a £30 victim surcharge. Ms Connor was prosecuted for failing to take all reasonable measures to ensure that an authorised person disposed of her waste, not for personally depositing the waste. The Council’s Cabinet Member for Environment, Councillor Karen Shore said: “As there have been other successful prosecutions for fly-tipping in recent weeks, it is clear that some residents still think they can dispose of rubbish wherever they choose. “Fly-tipping is a drain on Council services and causes problems for law abiding people in our community.